Synopsis (Goodreads): The moment seventeen-year-old Samantha Thompson crawls out of her grave, her second chance at life begins. She died of cancer with her long-time boyfriend, Ethan, by her side--a completely unfair shot at life. But Ethan found a way to bring her back, like he promised he would. Only Sam came back wrong. She's now a monster that drains others' lives to survive. And after she kills, she’s tortured by visions—glimpses into her victims would-have-been futures had she not killed them. Barely able to live with herself and trying to make things right, Sam ends up a pawn in a vicious game of payback within the local coven of witches. But when the game reveals what Ethan had to do to save Sam, she must make a choice that will change all their lives forever. I love the concept for The Monster Within, I was curious about what the MC would become and how it would all play out but unfortunately I was left underwhelmed and disappointed. Seventeen year old Samantha Thompson died of cancer and four days later was somehow bought back to life by her long-time boyfriend Ethan, but when she returns she is different and with the frightening capability of draining others of their life force and seeing visions of their futures just to sustain herself. Not able to stay in her home town any longer the two flee and start their lives from scratch with new identities, jobs, a home and schooling – it was a little far-fetched but I was still curious about what was actually going on. The beginning of the book was entertaining, I was eager to find out how Ethan had revived Sam and what she now was but this information took forever to come and I’m still unsure completely what had happened. I found myself skimming through the middle of the book and the ending is a confusing blur. I can’t say the characters wowed me, they were likeable enough but on so many occasions Samantha’s rash decisions grated on my nerves; she kept too many secrets and to me didn’t show enough remorse for what she was doing, she was more or less just brushing it off and Ethan wasn’t forthcoming about information at all, Sam had every right to know what he had done to bring her back to life but he was too selfish to reveal this important piece of information, the reveal was dragged out for too long. The villain was also quite obvious. Unfortunately, this book had a lot of plot holes; especially when it came to the witches/coven aspect and despite enjoying Kelly Hashway’s writing this book wasn’t for me at this time, I think it could have been wonderful but failed in execution. 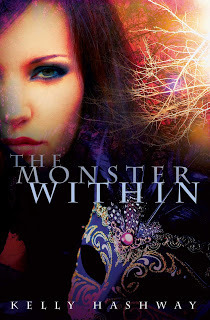 Thank you kindly to Spencer Hill Press for the opportunity to read and review The Monster Within by Kelly Hashway. Sorry this didn't live up to what you expected. I appreciate your honest review.